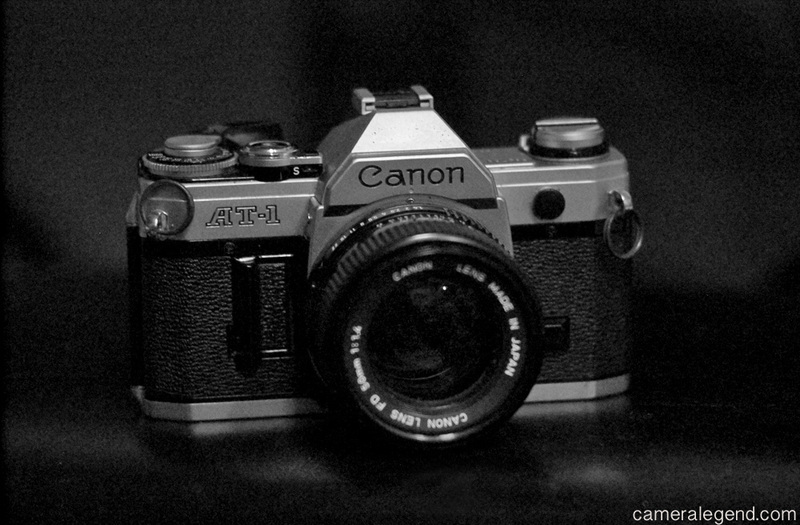 In a hazy cloud of memories, I still clearly remember the first SLR I ever touched, the Canon AT-1. The Canon AT-1 is a 35mm SLR released by Canon in 1977. It is part of the long defunct, but still highly popular Canon FD system. The AT-1 uses the Canon FD mount and is a no frills, manual exposure only camera. It does however need a 4LR44 battery to operate, which is probably one reason it seems unpopular or overlooked by the “all manual” club of camera lovers. The AT-1 is probably at the very low end of the classic Canon FD camera lineup, if not the lowest. However, I have noticed a slight increase in curiosity and desirability for this camera in recent years. It could be due to the low prices these cameras command or the fact that it’s a good learning tool for the novice photographer or any number of things, but this is what I see. All that said, I love this camera! This is the camera that changed my life, although not necessarily for the better. This post is not strictly about the Canon AT-1. It is not an official review of a camera a lot of people don’t know, or don’t really want to know about. It’s the story of how this humble “Plain Jane” camera played a key role in sparking the gear obsession that you see today. My first encounter with the Canon AT-1 was in 1981. With the help of a family friend, my parents bought a Canon AT-1 so they could take nicer pictures than what they got with their Kodak 110 camera. The funny thing is, they really weren’t interested in photography, they just wanted nice photos. The family friend had a nice Canon system built around the highly acclaimed and (at the time) hot Canon A-1. He was really a photo-bug and was always showing people his pictures and telling us of the competitions he entered, etc, etc. He was really a very good photographer. But to this day, knowing what I’ve come to know about cameras, I still find it questionable why this man would select the AT-1 for his friends knowing full well these two people (my parents) could not figure out an aperture or shutter speed from a door knob. Anyway, there’s more to this, but that’s a story for another posting. But back in the early 80’s this was not the case. If you look back to cameras from the 40’s up until the mid 90’s, before the dawn of digital, you can see that many people treated them like precious jewelry. That is why you find so many with engravings. They may still be considered luxury items today, yes, but today’s digital cameras, from the lowest to the highest of the high end cameras are known to be “disposable” inherent to their digital DNA. My parents apparently felt the camera was so precious, they had relatives look after it and it stayed in its case and in the closet most of the time. When we took our summer vacation in 1981, I saw the camera and asked my Mom if I could play with it. She said to “be careful” but yes. It was one of those feelings in life that you can’t describe, that money can’t buy. It was priceless. There I was turning the shutter speed ring, twisting the knob, focusing the lens and seeing things come in and out of focus in that beautiful and bright viewfinder. Wow. So on our return to New York in 1981, we were allowed to bring the camera back home with us and I was thrilled. But once back home, still a young boy not a teenager, the camera stayed again in its case in a closet for almost another year. Now, we’re in 1982 and I was more interested in the ColecoVision video game system we just bought in the summer of 1982. It was a clear and sunny September day in 1982. My brother and I took a ride from our humble Bronx abode to our family friend’s house in East Rutherford, New Jersey. We always looked forward to getting away from the inner city neighborhood in which we lived. Our friends had a nice house with a backyard, plenty of space to walk and run, and the complete feeling of safety, at least to us inner city kids. Anyway, after a wonderful day in Jersey, we arrived at our apartment, I’m guessing around 9-10pm. The house looked empty. We looked on the coffee table, the ColecoVision, gone. We looked at the stand; the stereo tuner, turntable, cassette deck, all gone. I looked in the closet for my precious AT-1…gone. Yes, as you can tell, we were robbed. We all stood there in shock. The place felt empty, it felt “dirty.” We were violated. Our privacy had been broken, and our property, taken. For my brother and I, it was a shocking arrival at the reality of the world which has an effect to this day. We all know the effect that crime and vandalism can have on our feelings of security. And we all know how much more magnified this effect can have on children. This is what happened to me. In some ways it made me better, wiser. I’m always looking over my shoulder. Even today. So how does that Canon AT-1 fit into this? Well, after the theft and for over thirty years now, I’ve been completely infatuated with cameras. If I were to take a psycho-analytical look at this, I would say it’s like winning a million bucks, but never getting to use even one dollar. It’s like having a fabulous meal in front of you, but dropping the plate. It’s like tasting the fruit, but getting only one bite. You want more. So as an adult, after I started working, I started picking up cameras here and there until it got entirely out of control. I tried to remedy this by selling a bunch of cameras on eBay, but then when got the itch, I’d start buying again. In all those years that I’ve been without the AT-1, I never had a desire to buy another one until recently. I got one in 2012 for $10 bucks. I have yet to use it. Not because I don’t want to. It feels fantastic, solid, great viewfinder, etc, etc. But at any time, I find myself using much more interesting cameras, and the AT-1 gets put in the back burner. The Canon AT-1 is a member of the legendary Canon FD line of cameras, but it may never be a true Camera Legend as its famous and much more popular sibling, the Canon AE-1 is. However, the AT-1 had a more profound effect on me than any camera, past or present. Even if you take away the trauma of the theft, the feeling of holding my first SLR and looking through its glorious viewfinder still resonates strongly in my head today.